1. Sauté ham about 5 minutes to release some moisture and slightly brown. 2. Add pineapple juice, let reduce. 3. Add honey and brown sugar, let caramelize. 4. Cook until 70% of the liquid is reduced. 5. Drain off most of the excess liquid if necessary. 6. Add remaining ingredients except the pineapple tings. 7. Cook until heated through out. 8. 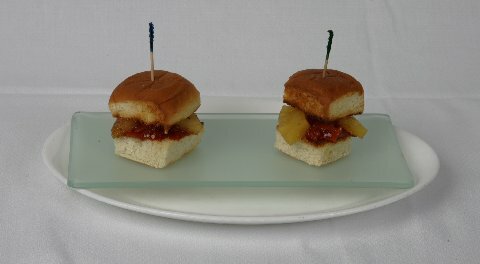 Top the bottom bun with ham mixture, and then place ½ of a pineapple ring on top or serve along side. Cover with top bun.